When days are shorter, we do appreciate to spend more time hunkered down at home. This is the time of the year when we want our rooms to be as cosy and comfortable as possible. Whether they are slung over a chair for impromptu snuggling or used as decoration on a sofa or a bed, wool throws are a must-have. They add texture, warmth and colour to a room and can transform ordinary furniture to the stars of the room. At Le Comptoir Irlandais, we are taken with Avoca and John Hanly, two companies renowned for the Irish throw. 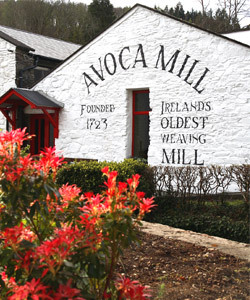 Since 1723, the looms in the Avoca Mill, County Wicklow have been weaving beautiful throws in natural luxurious fabrics like lambswool and mohair. Avoca represents almost 300 years of skills and expertise at the service of each crafted item infused with the vibrant colours of their local landscape. Their designs are inspired by the deep Irish roots of the company. Thanks to their traditional craft and ancestral skills, Avoca offers both attractive and qualitative throws that are exported worldwide. Established in Ireland in 1893, John Hanly & Co Ltd specialises in the manufacture of scarves, throws and fabrics in wool, lambswool, mohair and natural fibres. This family business is located in Ballyartella Woollen Mills, which is approximately 5 kilometres from Nenagh in County Tipperary. John Hanly & Co Ltd makes products of excellent craftsmanship, outstanding quality, which are timeless in their beauty. John Hanly & Co Ltd manufactures fabrics and accessories for top brands, designers and quality retailers around the world! The Irish plaids that we have selected are the ideal accessory to brave winter serenely. Cosy, warm and wonderfully knit in varieties of wool (such as mohair or lambswool), they enhance our interior. Discover our selection of Irish throws and buy yours by clicking here.